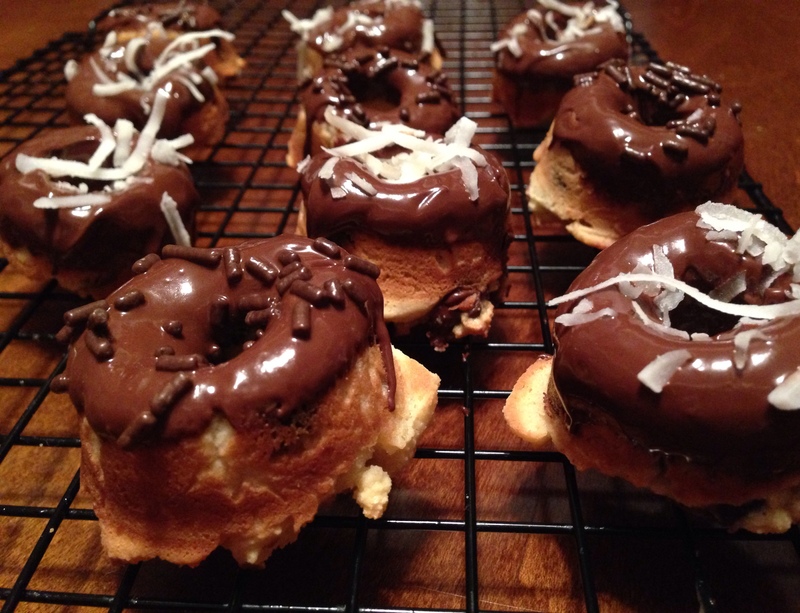 Sooooo – I might be a tiny bit obsessed with making donuts lately – I have another paleo donut coming your way as well. But I got a new donut baking pan, and HAD to use it. (Not to mention I needed to get rid of the chocolate in my house in prep for the clean eating challenge I’m doing with my clients). Heheheee! I’ve been using regular chocolate chips – not sure if that’s paleo, but I’m sure there are some paleo friendly chocolate chips out there if the real deals aren’t on the paleo menu. I topped these little lovers off with coconut and chocolate sprinkles (also prob aren’t paleo), but that’s where you could really have fun with it. Think – coconut, nuts, or just leave it plain! I got this recipe off of Tasty Kitchen. Great with a cup of coffee, for kids, or a clean cheat!! Sift the coconut flour, baking soda and salt into the egg mixture and mix until well blended. Hand mix in the chocolate chips if you’re adding those in. ← Put Some Prep in Your Step! !